Sometimes after-hour work functions can be the death of you. After a long day at the office and not-so pleasant weather conditions, the last thing you want to do is head out for some “rubbery banquet chicken.” While the weather may have been a little less than desirable with fog that had overcome Lehigh Valley last week, I was super excited to head to a dinner function for an event that I am vice president of: SKAL of Northeast Pennsylvania. Why was I so excited? Because the event was being hosted at Bear Creek Mountain Resort in Macungie and it is absolutely a gorgeous facility. I had a date to accompany me that night and he had never been to Bear Creek so I was curious to see what he thought of the place. When we got inside I would say he was totally amazed that a facility like this existed within 10 miles of his home. I’m pretty sure we’ll both be enjoying the joint Christmas present I purchased for us for a couples massage at The Spa and dinner at The Grille. I have not been to the spa yet myself, but there were a few people that night that were commenting on how wonderful it is. Now I really can’t wait to make another visit. That night we started in The Grille at the bar area for a cocktail. This is a great atmosphere with a very large stone fireplace that sits in the middle of the room. There were plenty of specials during happy hour to choose from which is always nice. I’ve had dinner there before, and the selection is just as outstanding, offering everything from burgers to veal to seafood. Next, we were off to the Fireside Suite. This is a smaller private room that accommodates up to 30 guests. It, as its name suggests, has a fireplace in the room making for an intimate setting. It also has enormous glass windows that allows for spectacular views of the mountain, had there been no fog. There is also a small outside deck area. Dinner that night was a beautifully presented salad, bourbon glazed salmon with perfectly seasoned accompaniments and New York Style cheesecake for dessert. The service has always been impeccable each time I have been there and the food is just as good. Kudos to the chef. 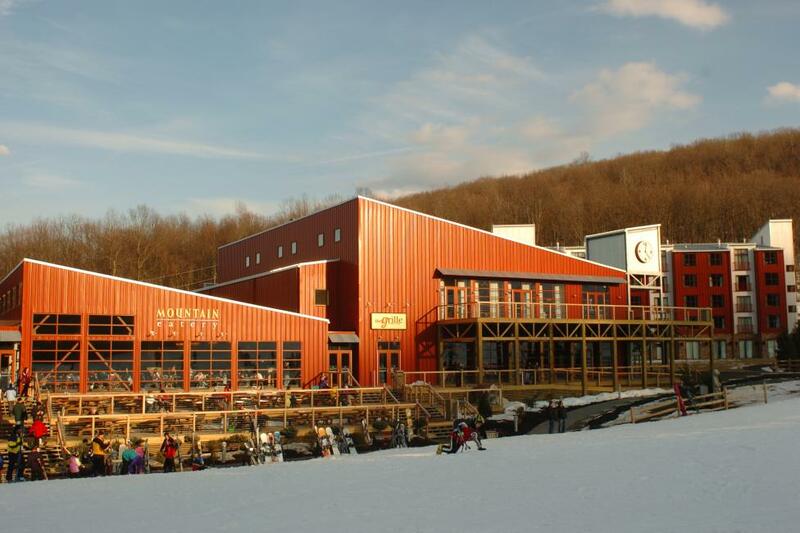 Whether you’re looking for the perfect romantic evening, a place to host a wedding reception, a night out on the town with your friends or family, or a place to let your wild side shine through on the slopes, Bear Creek is worth checking out. I’ll be sure to let you know how the spa is once I’ve gone!